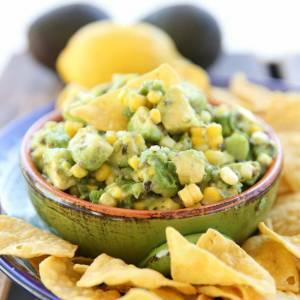 A deliciously unique salsa featuring creamy avocado and a seasoned savory dressing. 1 1/2 cups corn *you can use 1 can drained corn, frozen corn, or fresh corn on the cob, steamed and cooled. Combine corn, green onions and olives in a medium sized mixing bowl and set aside. In small container whisk together olive oil, lemon juice, apple cider vinegar, garlic, oregano, salt and pepper. Pour over corn mixture and stir to combine. Add avocados and toss gently until combined. Serve immediately or cover and chill in the fridge. Use tortilla chips for dipping.